Looking for an executive gift that shows real appreciation and thoughtfulness...something truly unique? Your Memory Lane art prints are custom made and personalized with the individual's, company's, or organization's most important milestones, moments, and memories. A truly unique keepsake gift and constant reminder, wherever it hangs! Cully McLean and their staff of artists work personally on every art print, transforming the list of information that you provide into the colorful graphics, icons and logos that you see interwoven throughout the street. The vehicles in the street, items in the sky, the street signs, and the dedication line... all personally created for the recipient. We would love to talk with you the next time your gift requirements call for something "special". Take a look around, see some of what we've done for others... and imagine what we can do for you! If it's worth remembering... it belongs on Your Memory Lane! PRICING: Our prices start at $430.00 (for the first framed print) and include all creative work, a review proof, and customer corrections. Duplicate framed prints in quantities of 2-10 are just $145.00. 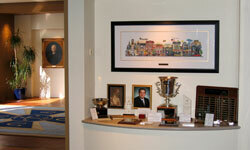 We also offer large lobby-sized prints, metal engraved plaques, and completely designed custom pieces. Corporate projects require and deserve the personal touch, contact Cully McLean with questions, comments or just conversation at 770-745-7225. 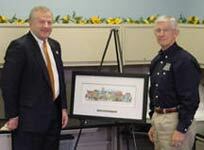 Photo left: Knoxville Tennessee's retiring Chief of Police receives a Memory Lane print from his friends. An oversized print in the lobby of ATO Headquarters. Corporate programs can include an oversized print for your lobby or office. We can make it virtually any size without loss of color or detail. When a photograph just won't work, Your Memory Lane will. The Downtown Long Beach Association, used our 8-Building Street configuration to showcase their waterfront area and the many events that make it a thriving tourist and business district. A framed copy of this commemorative print was presented to each of the board directors and the executive committee members. This print was produced in two versions, with and without the individual board members' names on it. "The NBA on TNT" - This print was giving to clients of TNT's that attended the NBA All Star Game February 2008 in New Orleans. The print chronicles the events and activities that were planned for their guests, including the hotel, various venues, entertainment, and images unique to New Orleans. The colorful and impressive history of Abbey Road Studios was a personal gift to an unnamed studio executive... it's the thought that counts. The St. Louis Blues hockey team found that semi-personalized Memory Lane prints make a perfect farewell gift for retiring and traded players. Half of the personalization on this street refers to things that all of the players and their families share, such as restaurants and clubs. The remaining half is personalized for the particular player and their family. NYSACRA members are voluntary, not-for-profit agencies that serve people with developmental disabilities, their families, and the vendors and other affiliated organizations providing services. This year was the 30th anniversary of the organization. A Your Memory Lane print was used as visual to commemorate the occasion. Carvel and Cinnabon both use framed Your Memory Lane prints as achievement awards and employee appreciation gifts. Starting with her first job as a High School English teacher Karen Jennings went on to become President of Southwestern Bell Corporation and ended her career as Executive Vice President and Board Member of AT&T. Her rich life is further enhanced with those memories involving family, friends, sports affiliations and personal activities and achievements. This print was presented at Karen's retirement celebration. UPS... a sample project in construction (20% complete) ... A 100-year commemorative product. Mission Aviation Fellowship provides aviation, information technology and learning technology services to hundreds of Christian and humanitarian organizations worldwide. MAF is moving their offices from California to Idaho which will leave behind over 50 valued employees and volunteers. Memory Lane was the perfect farewell gift for those that were not making the move. Call Cully McLean at 770-745-7225 to discuss our corporate Memory Lane programs. Copyright © 2007-2019 YourMemoryLane.com. All rights reserved. YourMemoryLane.com is a division of McLean & Friends, Inc.